This super delicious slice is something that I make regularly and every time someone always asks me for the recipe, so I am posting it here, as it such a fast, easy, cheap, but SUPER popular sweet treat! It is seriously delicious and so fast to make too – I love quick, easy, cheap and super yummy recipes! This is definitely one of my all time favourite things to make and eat!! So here it is! 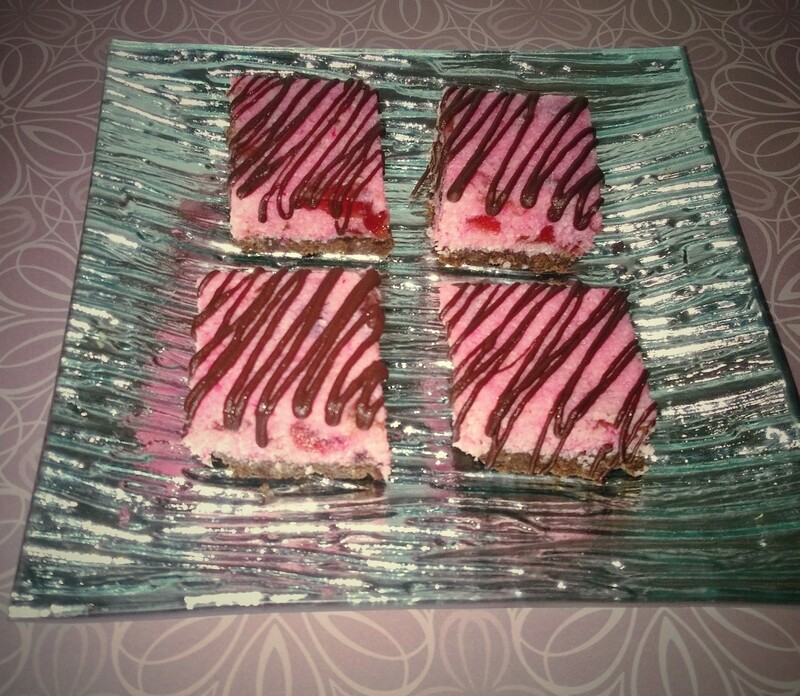 Cherry Ripe Slice! You will thank me later! Makes: 30 pieces. Time: 20 minutes. 250 g packet of chocolate ripple biscuits or other plain chocolate biscuits. 1. Grease and line a 20 x 30 cm pan. Place the biscuits into a food processor and process until fine crumbs form. Add butter and process to combine. Press into the base of the pan. Chill. 2. Meanwhile, combine coconut, condensed milk, glacé cherries, and vegetable shortening in to a large bowl. Add a few drops of food colouring, (I also added a teaspoon or two of cherry brandy essence for extra scrumminess! But this isn’t technically in the recipe) and mix well. Spoon mixture evenly over the prepared and chilled biscuit base. Refrigerate until firm. 3. Cut the slice in to 4cm pieces. Spoon the melted chocolate in to a zip lock bag and snip the corner. Drizzle over the square of slice, chill until set before serving. This entry was posted in Recipes and Meal Planning and tagged cherry, cherry ripe, cherry ripe slice, Chocolate, chocolate biscuits, coconut, condensed milk, recipes, ripe, slice. Bookmark the permalink. ← Magnet Fishing: A fun way to learn loads of concepts for school readiness! !